French voters are heading to the polls to choose France’s next president. 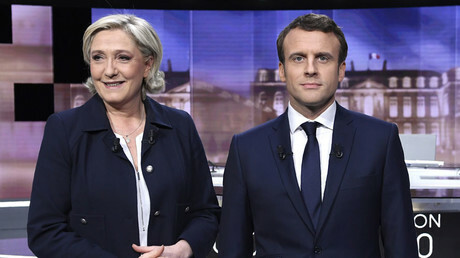 The presidential runoff between centrist Emmanuel Macron and right-wing Marine Le Pen is the first to take place amid an ongoing state of emergency, introduced in the country after 2015 terrorist attacks. French authorities have introduced extra security measures for the poll. This time “more than 50,000 policemen, gendarmes will be deployed [across the country] on Sunday”, French interior ministry spokesman Pierre-Henry Brandet told AFP on Thursday. Soldiers from Operation Sentinel will also “ensure security around polling stations and [will be able] to intervene immediately in case of any incident,” he added. Operation Sentinel was launched by the French Army in the aftermath of the Charlie Hebdo attack in January of 2015 and the subsequent Paris strikes. Paris police promised that at least 12,000 soldiers and police were to be drafted to Paris and its surrounding suburbs on Sunday, with 5,000 of securing polling stations and guaranteeing public order, as cited by AFP. People on social media have been calling for protests on May 7, regardless of the election result. The hashtags #nimacronnilepen (neither Macron, nor Le Pen) and #SansMoiLe7Mai (May 7 without me) was launched after the first round of the elections on April 23. Macron won the first round by securing 24.01 percent of the votes to le Pen’s 21.3 percent. 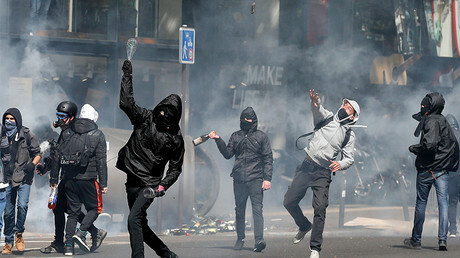 Demonstrations have rocked France following the 1st round vote with people rallying against both candidates. “Neither fatherland, nor the boss, neither le Pen nor Macron,” banners held by protesters read. The rallies have often resulted in violence with protesters throwing stones and smoke grenades and police and officers responding with tear gas. France has been under a state of emergency since November 2015 when at least 130 people were killed and 368 injured in coordinated attacks in Paris and Saint-Denis, a northern Parisian suburb. Also in July, two Islamic radicals murdered Father Jacques Hamel at the Saint-Etienne-du-Rouvray church in northern France by cutting the 85-year-old priest’s throat. The most recent attack took place days before the first round of presidential elections on April 20. An Islamic State sympathizer opened fire on the Champs-Elysees killing a police officer.